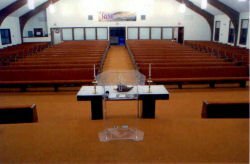 Hundreds of churches across America have used Artech Church Interiors’ on-site pew upholstery system. 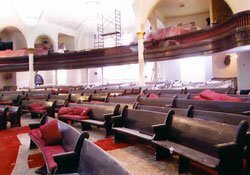 Adding new upholstery or replacing worn pew cushions takes only a few days, in most cases, and there is no disruption of services, when you have us do your upholstery. 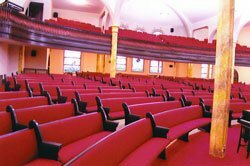 Any size or style of pew – curved or straight – Artech’s specialists will redo them quickly and beautifully. We can upholster seats only, seat & backs or seat, back and the rear. Our exclusive ‘Artech System’ comes with a 15 year warranty. 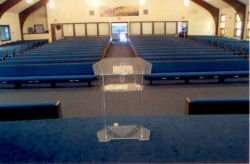 Can be installed without interruption to church activities! 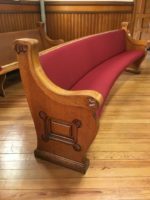 Just like new upholstered pews at 1/4 of the cost! 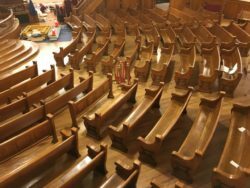 Unlike our competitors, we do light wood refinishing, along with the reupholstering, on-site, to make your pews look like new. 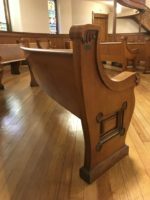 A “waterfall effect”, on the front of the pew, is more comfortable & retains its appearance for many years. We do this with a special stretching tool that gives a smooth appearance. We use virgin polyurethane foam for our cushioning material (1″ for back and 2″ or 3″ for seat). The polyurethane will retain its elasticity, is non-absorbent & is hypo-allergenic. 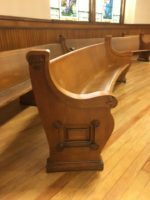 This is the same cushioning material used in new pews. We also use 100% nylon, scotch guard treated fabrics. 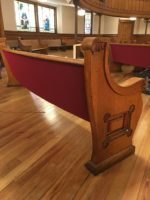 These are the same fabrics used in the manufacturing of new pews. Our scotch guard treatment is immersion applied, not just sprayed on. 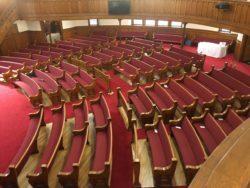 Back upholstering stops at the cap rail, like on new pews. We use a tacking strip, at the cap rail, to assure the back upholstery is in a perfectly straight line, with no uncomfortable upholstery buttons to eventually break loose. We leave a large fabric flap, at the bottom, and apply a minimum of two rows of staples. This prevents the fabric from loosening, over time, and wrinkling. We use a tacking strip, on each end, that allows us to stretch the fabric both vertically & horizontally. Firmly anchored upholstery fabric, will look brand-new for years!